I have been part of a culinary book club for the past 20 years or so--we can never agree on just when we started or how long we've been meeting, it has been that long. I think I was just finishing up the Rambler badge in Girl Scouts. Or had I just won the spelling bee? More likely, I was doing laundry on weekends for a college-age child. 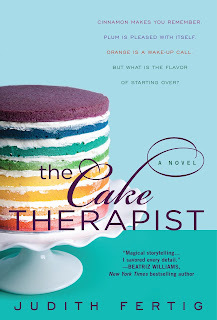 This book club has been one of the joys of my life. Eight of us meet in January to select our culinary-themed books--they can be cookbooks, biographies or autobiographies, memoirs, or foodie novels. Each person chooses a book and a month that they can host book club in their homes. The hostess makes the main dish and provides the beverages. The rest of us bring a dish. The dishes might be from the cookbook or inspired by the novel or biography. Liz always likes to host when we can be outside. We will read a book, enjoy a gourmet potluck of dishes everyone brought, and then go outside and watch a movie on her patio. We've seen "Moonstruck" (Italian cookbooks) and "Chocolat" (Chocolat), among others. Roxanne introduced us all to the Pioneer Woman, the Julie and Julia blog, and a to-die-for cookie exchange. 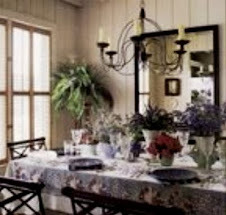 At Gayle's condo, we compared the novels of the late, great Pat Conroy with the cookbook he wrote The Pat Conroy Cookbook: Recipes and Stories of My Life. And, of course, enjoyed coastal Southern food. We explored the world of Chef Thomas Keller at Kathy's house and we didn't have to book a table a year in advance! Vicki, a food stylist, always passes along a great tip. At her house, we cooked our way through Virginia Willis' Bon Appetit, Y'All. We once read Epitaph for a Peach, a memoir from a Japanese-American farmer who grew fabulous peaches that were not tough enough for shipping by truck. The next month when we were reading Susan Herrmann Loomis' French Farmhouse Cookbook, I splurged and had some Suncrest peaches Fed-Exed as a treat and we still talk about how juice-dripping-down-your-chin delicious they were. Karen likes to host in winter, when we can sit around a table in front of her fireplace. 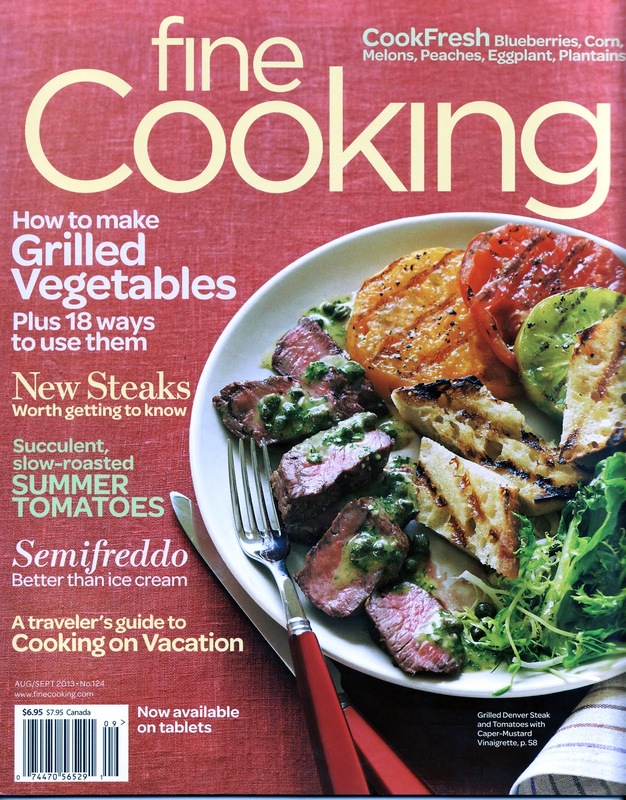 We usually do a comfort food book such as French Comfort Food or something by Julia Child. 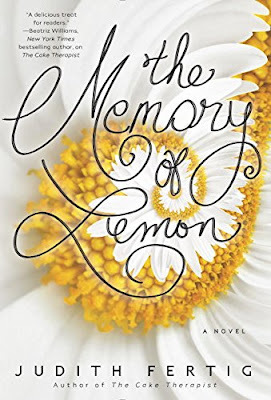 Recently, our group was kind enough to read advance copies of The Memory of Lemon and my good friend (and bbq co-author) Karen hosted. And here's how we did it. 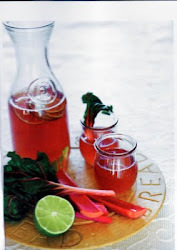 A signature drink for a book club is always fun and generally easy to do. Karen added a jigger or so of limoncello to a champagne flute, then topped it up with prosecco (or other sparkling wine like a Spanish cava or a French champagne). This made an easy and refreshing lemony cocktail for a pre-book club toast. 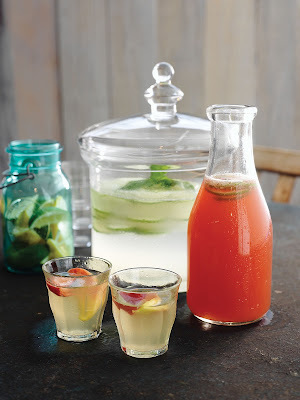 For a non-alcoholic option, make Porch Swing Lemonade and serve it over ice. 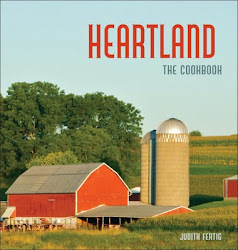 Adapted from Heartland: The Cookbook by Judith Fertig. For the syrup, combine the sugar, water and herbs in a large microwave-safe glass measuring cup. Microwave on High for 3 to 4 minutes or until the sugar dissolves. Let the mixture steep for 20 to 30 minutes to extract the best flavor. Strain the mixture into a bowl and let cool. Use right away or store in a covered glass jar and refrigerate for up to 2 weeks. Stir the lemon juice, syrup, water, and sugar together in a large pitcher. Add lemon or lime slices and herb sprigs, if you wish. Serve cold. Even if your book club generally only does appetizers or desserts, sometimes it's fun to change things up a bit and offer a light meal. Especially in summer. That's what we did. Our theme for recipes was lemon. You can assign recipes and e-mail them to club members or trust members to choose and prepare good ones. Or have people bring prepared food if they don't cook. You can ask or be surprised. It's your book club! 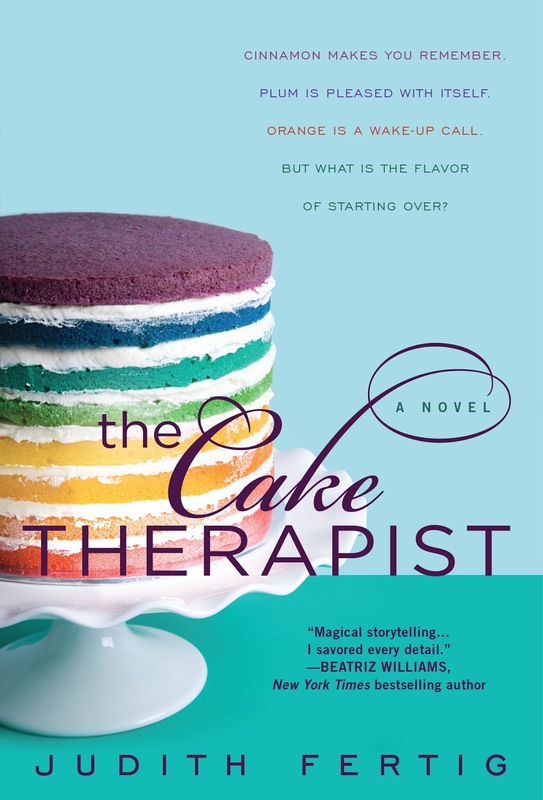 Book club is also a good excuse to use that china or glassware you've been wanting to pull out. You know your book club members will appreciate a lovely table or an artistic gesture. Karen used the pink Depression glass lunch set passed down from her mother-in-law. We usually serve buffet-style, as this makes it easier on the hostess. Drool Alert: Here is what we had. . .
Kathy is our resident bread baker. She adapted a recipe from Heartland: The Cookbook and included honey and lemon zest for a bread with a tender, moist crumb and an aromatic flavor. Liz brought a shredded raw carrot and raw beet salad dressed with a lemon vinaigrette made with walnut oil from Virginia Willis' Bon Appetit, Y'All. Liz brought the carrots and beets separately, in sealable plastic bags, to keep the colors intact for as long as possible. Once you toss the salad, the colors start to blend, but it's still beautiful, don't you think? I brought this Greek Orzo Salad with Cucumber, Lemon, Kalamata Olives, and Feta. It's a great pasta salad that I could just eat all day. In a large bowl, combine the drained orzo, green onions, spinach, cucumber, feta, and olives. In a small bowl, whisk the olive oil, lemon juice, and seasonings together. Pour the dressing of the orzo and toss to blend. Refrigerate until ready to serve. The simple vinaigrette of 4 ingredients magically dresses a big bowl of salad greens. Fresh lemon heightens the flavor. Place the salad greens and accompaniments in a large salad bowl. In a small bowl using a wooden spoon or in a mortar and pestle, mash the garlic with the salt until it makes a fine paste. Stir in the lemon juice, then the olive oil. Pour the dressing over the salad and toss to blend. Serve right away. Karen decided to test a recipe for our upcoming Red, White, and 'Que cookbook (Running Press, 2017), so she made grilled chicken spiedini over pasta tossed with arugula. Fabulous, but Secret. For now. For more lemon recipes in a colorful downloadable booklet, e-mail me at judithfertig1@gmail.com and I'll send them to you. This past weekend, I was reminded again of the power of synchronicity or that magical coming-together of "your wish is my command." I wanted to make a fruit crisp for a family dinner. When I went out to the backyard, I saw that along the fence, volunteer mulberry trees were full of berries. Wild, organic, free, and convenient. Perfect! Thank you, Universe. I've picked mulberries since I was a kid at camp. Years later, when I was working on Prairie Home Cooking, I gathered them to test a Russian Mennonite recipe from central Kansas, which became the fruit crisp below. Ripe mulberries get squishy fast, so you don't often see them at farmer's markets. But with a little luck, you can find them if you tune in your radar. and writing a flashback about The Singing Lady, a woman who had a children's radio show out of Chicago, I happened upon a vintage cereal box from the 1930s with a Singing Lady story on the back. I got that feeling right under my heart that I was on the right track. Keep going, the universe seemed to say. The same thing happened when I was writing The Memory of Lemon. Just what I needed--a look at Carolina parroquets in all their glittery plumage. Again, "Keep going" whispered to me at a time when a writer can feel like it's all too much. So I wasn't too surprised when the thing I really wanted just turned up in a very explainable, yet very magical way. Next time, maybe I should ask for a New York Times bestseller. Oops, I just did. . . . If mulberries are available, try mulberries in place of all or some of the blackberries in this wonderful crisp—just as good for breakfast as it is for dessert, if you have any left! Preheat the oven to 375 degrees. Lightly butter a large baking dish. Combine the berries, rhubarb, tapioca, lemon juice, and 1 cup of the sugar in a large bowl. Stir gently to blend well. Transfer the fruit mixture to the prepared baking dish. Combine the remaining 1 cup sugar with the flour, lemon zest and butter in a bowl. Mix with your fingers to make a streusel or large crumbs. Sprinkle the streusel on top of the fruit in the baking pan. Bake for 35 minutes or until bubbling. To serve, scoop the warm crisp into a bowl and top with a scoop of ice cream. but with grilling this time. I am a cookbook author and a bbq queen, too! I wear a chef's hat and a tiara when I'm not sitting in front of my computer, waiting for inspiration to strike. Our outdoor kitchens today may be stainless steel and the open fire may come from hardwood lump charcoal or a propane tank. But our love for French-inspired food continues. Barbecuing with a French accent is easy. Simply pair a grilled Brie and tapenade-stuffed chicken breast with a classic bistro salad, a baguette and a bottle of wine or a cocktail. Stir up an easy Bearnaise Sauce before you throw the steak on the coals. Slice the new “it” vegetable—cauliflower—into “paillards” or steaks to grill to a delicious turn. 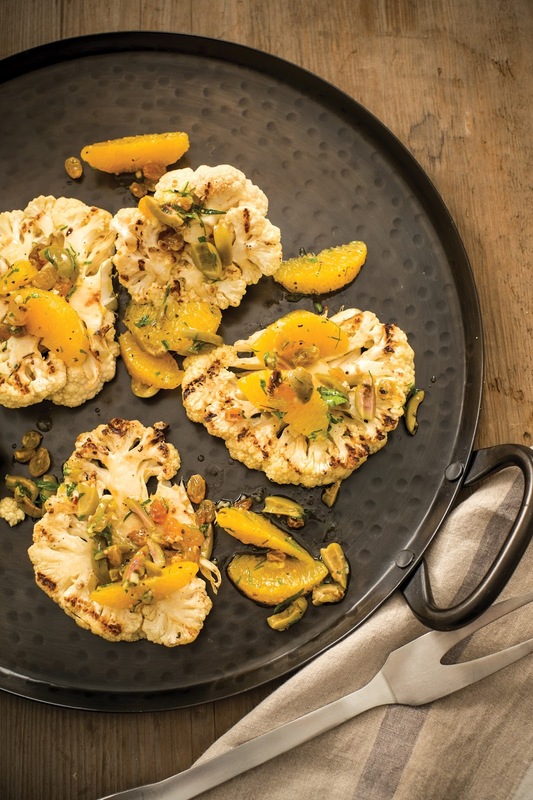 You can’t believe how great cauliflower can taste with a few grill marks and a little Orange-Olive Pistou, a south-of-France riff on pesto or salsa. For a wow-y appetizer or main dish, grill asparagus and flatbreads . Then put them together with a dollop of lemon aioli and a sprinkling of feta and pistachios for a flavor combination that is c’est magnifique! Or put a classic French daube or stew on your smoker to get that ancient flavor of hearth cooking. Voilà! 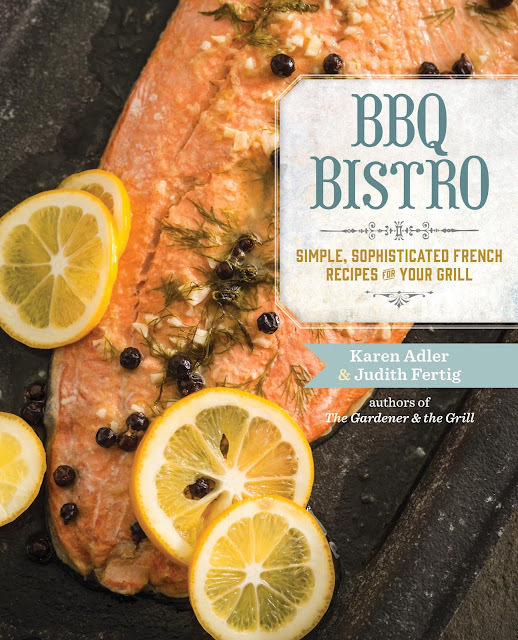 That’s BBQ Bistro by Karen Adler and Judith Fertig (Running Press, 2015. These Kansas City authors continue their fresh take on backyard barbecue from The Gardener and the Grill and Patio Pizzeria. To increase your grilling savoir faire, BBQ Bistro offers an array of barbecue techniques from grilling on a plancha and cast iron to rotisserie, grill-roasting, herb grilling, and slow smoking. These techniques reach back to the hearth-style cooking of long ago and blaze ahead to the fresher way we want to eat now. Aioli is a garlicky mayonnaise from Provence used to accompany fish and shellfish, but we love it with grilled salmon or a platter of grilled vegetables. The trick to making light, fluffy aioli in a food processor is using the whole egg instead of just egg yolks. If the food safety of raw eggs is a concern for you, use pasteurized eggs in their shells or 1/2 cup (125ml) pasteurized liquid whole egg. This is a milder aioli with a hint of lemon. In a food processor, combine the eggs, garlic, lemon juice, and mustard; pulse to blend. With the motor running, through the food tube, gradually add the olive oil, processing until thick and creamy. Store in an airtight container in the refrigerator for up to 3 days. French flatbreads are deliciously simple. In the north, the Alsatian tarte flambée or flammekuchen is a thin flatbread made with yeast dough and topped with crème fraiche, lardons (bacon), and onion. In the south, fougasse has the filling rolled into the dough and is shaped in a leaf form. We have taken the yeast dough, rolled it thin, and then grilled it to await the French toppings of grilled asparagus, lemon aioli, feta, and pistachios. (The French feta cheese is mild and creamy and usually made from excess sheep’s milk that is not used for making Roquefort.) With a flute of Champagne, life is good. Prepare a medium-hot indirect fire in your grill. Divide the dough into four parts. Pat or roll each part into a 6-inch (15-cm) oval on a floured surface. Brush both sides with olive oil and place on a baking sheet to take to the grill. Trim the asparagus, brush with olive oil, season with salt and pepper, and take out to the grill. Place the asparagus spears perpendicular to the grill rack. Grill for 8 to 10 minutes, turning often, until the asparagus is tender-crisp and has charred a bit. Transfer to a cutting board and chop into 2-inch-long (5 cm) diagonal pieces. Set aside. Place the dough ovals on the grill grates. Grill for 2 to 3 minutes or until the underside has good grill marks. Transfer the dough ovals to the indirect side, grilled side up. Dollop Lemon Aioli on the top of each grilled dough oval and spread it quickly with the back of the spoon. Scatter with asparagus, and then sprinkle with feta and pistachios. Close the grill lid, and grill for 3 to 4 minutes or until the feta is beginning to melt and the dough has cooked through. Serve warm and pass the remaining Lemon Aioli at the table. I'm a food and lifestyle writer, award-winning cookbook author, and tiara-totin' BBQ Queen. A prairie girl at heart, I love fresh, seasonal food and a simple yet sophisticated style, whether in barbecue, baking, or design. I am represented by The Lisa Ekus Group at www.lisaekus.com. 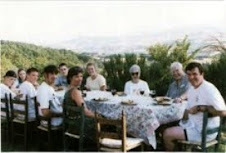 My family enjoys a dinner in the courtyard of a Tuscan villa.